Both my little ones have left only a few days from each other. Oscar was a surprise. He was old, but healthy. I gave him some food before I went to bed on November 2nd. The next morning I saw that he hadn't touched the food during the night. I looked inside his nest and I found him inside as if he was sleeping, but he had already gone during his sleep. I felt sad to lose him, but also relieved because he hadn't been ill and didn't suffer. He died of old age. 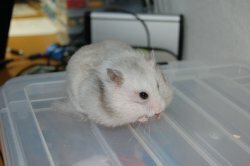 Luna passed away less than half an hour ago. She had been ill for almost two weeks. She started having trouble breathing, so I took her to the vet. She was taking her medicine twice a day, but wasn't getting better. Last Sunday she suddenly got very weak and had some blood in her nose. I took her to the vet again and the doctor changed her medication. She seemed to have gotten better yesterday (Monday). She slept in a towel on my lap for a long while and her eyes were alert. This morning I gave her her medicine and I went to work. She was sleeping on the towel that I put in her cage yesterday night to keep her warm. I made her drink her medicine again, then I put her in a towel on my lap while I was sitting on the computer. She slept there for a while and then came out from the towel and lay to sleep again on my leg. A few minutes later she started coughing and I knew that she would go soon. 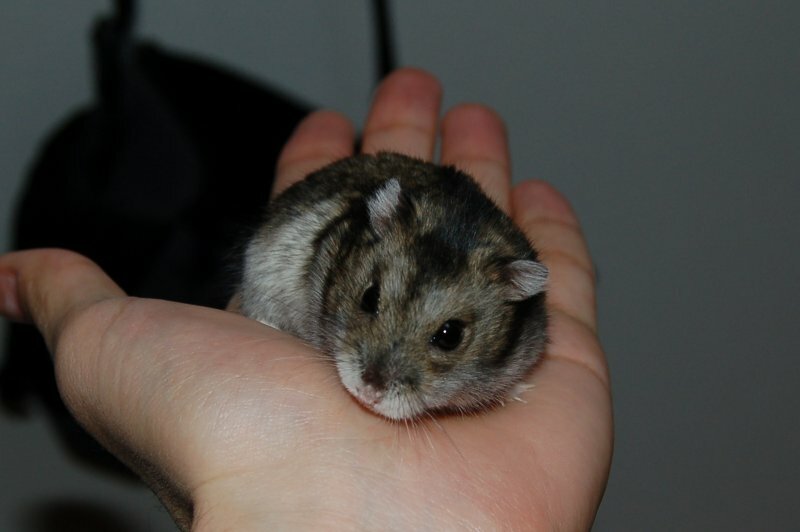 I took her in my hands and kept her warm until she passed away. I wish I had posted more about them during the last months, but I've been too busy. New job, new apartment, studies, and a couple other things more. Right now I don't have plans to get another hamster. Maybe in a few months, or a year, or more. I don't know. I guess this is the end of this blog, at least for now. The existing content will stay, it will not be deleted. People will be able to come and see the stories of all my babies, but there won't be any new stories for a long time. Thank you to everybody who has been reading thi blog. Papa, can you help me? I would like to chew on these electric cables, but I can't reach them! Why did you put them up there? Ok, if you don't let me play with them then I will have to play with you! Sometimes Papa is doing things on his computer when I'm playing on the floor. I want to play on the computer too, but I can't climb into the desk alone. What I do is climb between the desk and the wall, and then when I reach the top Papa has to come and get me. He says that I could fall and get hurt. That's crazy talk, because everytime I look his hand is always there. Papa told me about this little boy. He's only three weeks old and already loves to play with people. Look at his lovely smile! There are more photos of him in Pyza's Flickr set. He needs a good home with a lovely owner. He's in Warsaw, Poland. If you know a good human who wants to be this boy's lovely Papa or Mama, then send a mail to Pyza via FlickrMail by clicking here. Today it was our cage cleaning day. Every Sunday Papa comes and cleans my cage and Luna's. We have to wait in a small carrier cage while he cleans. 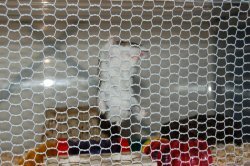 The first few times I got a bit upset when I had to wait in the carrier cage, but now I have gotten used to it. I don't mind because Papa puts some fresh food on it. After my cage was clean Papa put me back on it. Every Sunday I check everything to make sure that he didn't forget anything. Yes, everything's fine. Thanks, Papa! 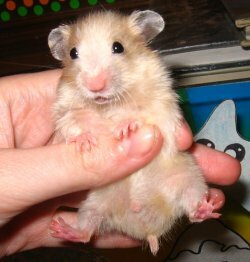 You have to vote because us little hamsters are not allowed to vote. What are you waiting for? Ok, Papa, I'm going! 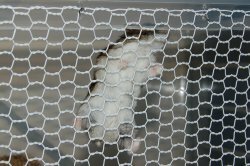 Can you please help me get out from my cage? Remember the new nice house that I got last month? Well, I don't have it anymore. Papa removed it a couple of weeks ago. I guess I shouldn't have used a corner inside it as a toilet. Sometimes I feel lazy when I'm warm in my nest. It's easier to use corner inside the house than going out to my sand toilet. Papa noticed because my sand toilet was too clean. 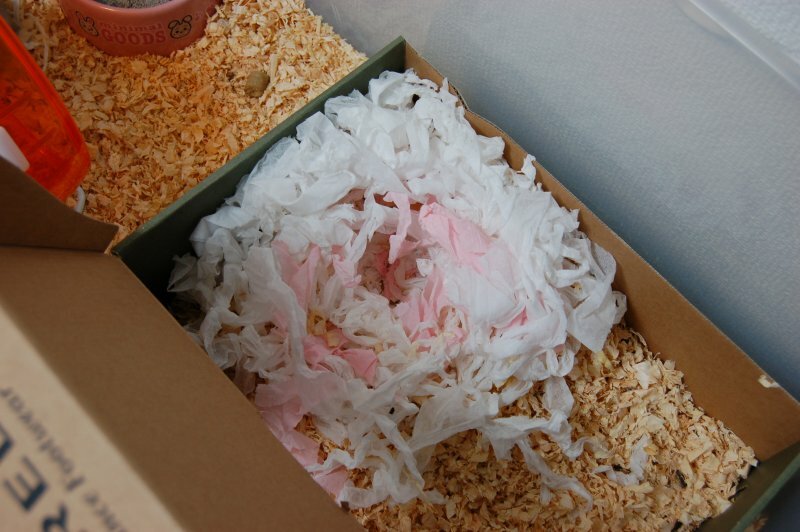 I have been using a tissue paper nest near my wheel for a few days already. It's ok because it isn't cold anymore, but my wheel got angry again. Sometimes she doesn't want to turn when I try to run in her. Papa brought me a new home. It's made of straw and it has a hole to go inside. Let me see... It tastes ok.
And this is how you go inside, right? Hmmm... Sorry Papa, but it's too small and too light. 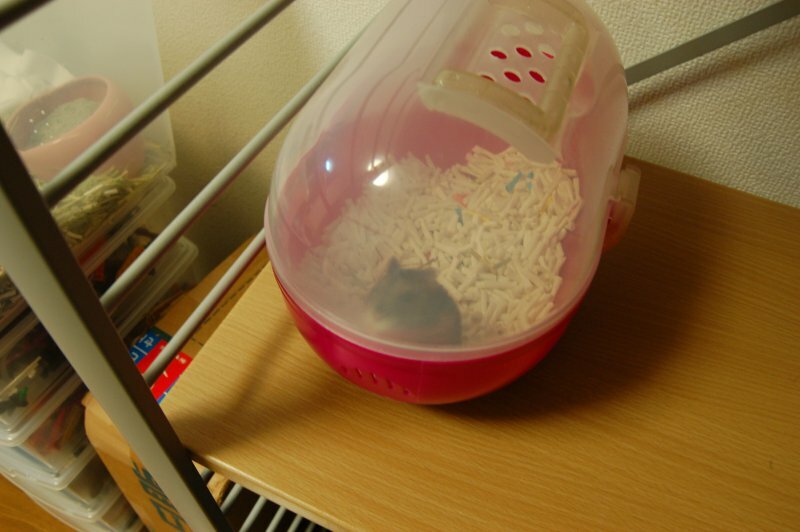 The new home looked fine, but it was too small for me. It was too light and I couldn't move my big nest inside it. I told Papa to look for something bigger and heavier. In the meanwhile I'm keeping my nest near my dear wheel. Papa cleans my cage every week. He usually puts everything back in its place so I don't get stressed. I just have to rebuild my tissue paper nest every time, but I don't mind. Yesterday there was something different. 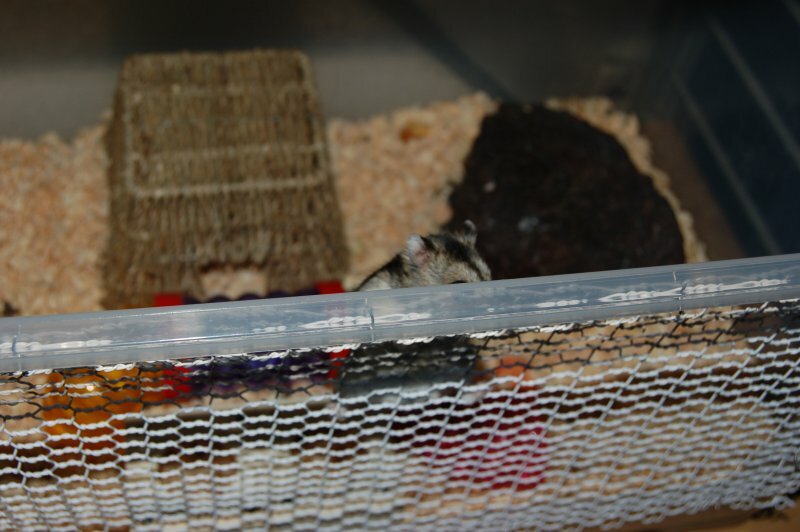 My old straw home was in its usual place, but in the other side of my cage there was some kind of rock. In the beginning I was a bit nervous about it, but then I went to investigate. I climbed on it. Nothing interesting there. Then I decided to look around it and I found that it had a hole under it. I went inside and saw that there was a nice dark space there. Just as I like it! I went out an in a few more times to make sure that it was safe. Everything seemed to be fine and I decided to build my new nest there. 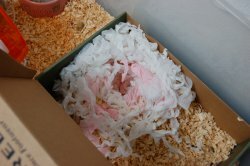 Later during the night I moved some of my tissue paper from the straw home to the new nest under the rock. Papa told me that rock is sold in the pet shop as a house for fish, but that's crazy. Everybody knows that fish live in the water, and there's no water under this rock! 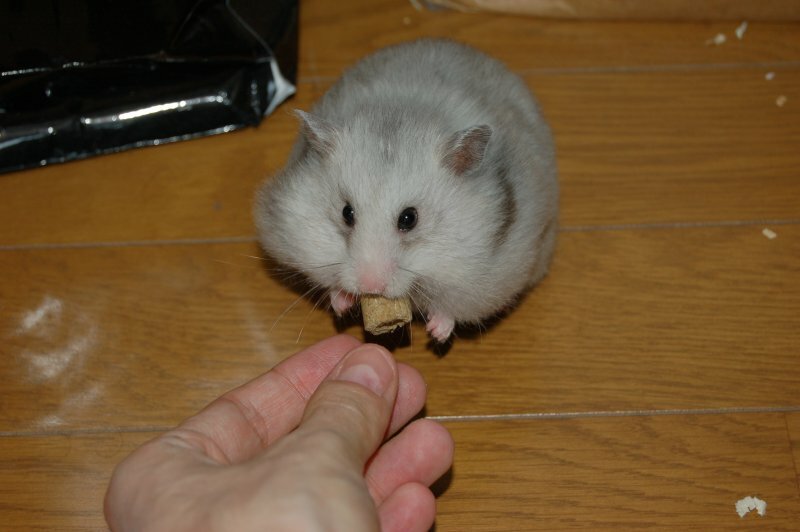 When Papa gives me my hamster mix I always eat these little dried fish first. That's my favourite food. I think Papa noticed. 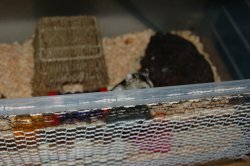 Yesterday when he arrived home I came out from my nest and went to the front of my cage to greet him. 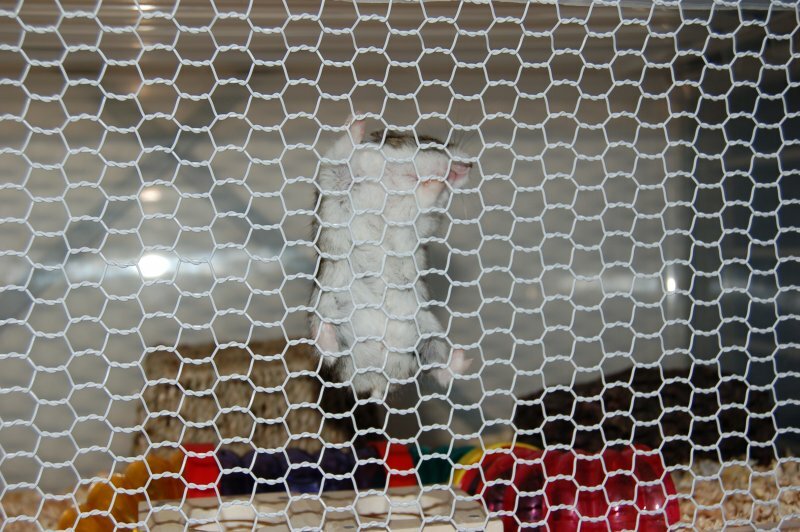 He put his hand inside my cage and I climbed on it like every night. But this time he didn't have any of my seed and fish mix. He gave me a very big dry fish! It was so big that I could eat only half of it. I had to put the rest inside my cheek pouch. I asked Papa for more and he gave me another one! Looks like he has a box full of them! 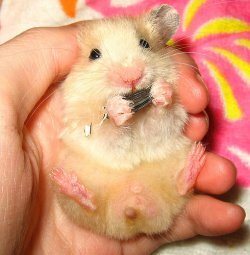 I managed to put another one in my cheek pouches. 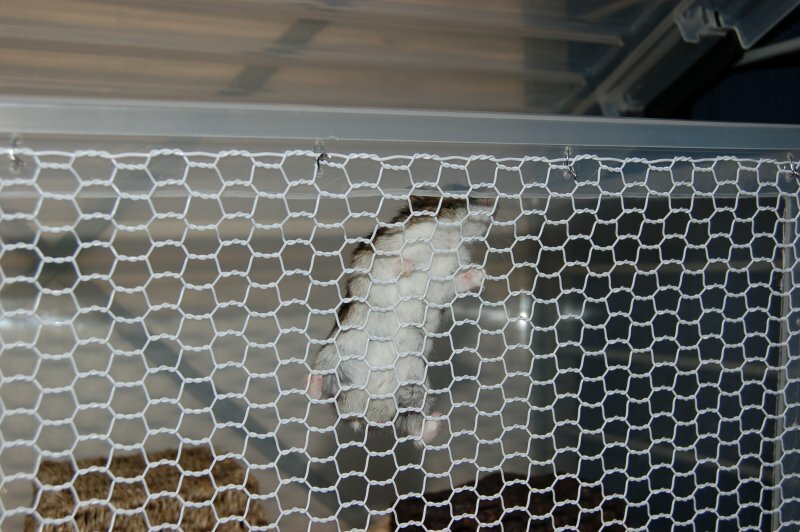 When I couldn't carry more Papa put me back in my cage and I went back to my nest. I'm going to eat lots of fish because I want to get as big as Luna! Finally I found where my food pellets come from! They come from a box inside Papa's closet. I found out yesterday night because Papa left the closet door half-opened and I ran inside. 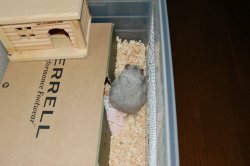 The box had disguised herself as a hamster, but she couldn't fool me. I could smell the pellets and there was no hamster smell! I ordered the box to give me some pellets, but she ignored me. I tried to get inside, but it was too high. Instead, I decided to open a hole and get the pellets myself. That will teach her to give me pellets when I tell her to do so! Luckily, Papa didn't see what I did. He was there, but he was looking at the screen on his camera. I'm sure he didn't see me. Is this one of my relatives? Yesterday night when I was playing on the floor Papa went to the kitchen. Usually the kitchen door is closed and I don't have many chances to play and explore there. So I followed Papa! This time I found something very interesting. 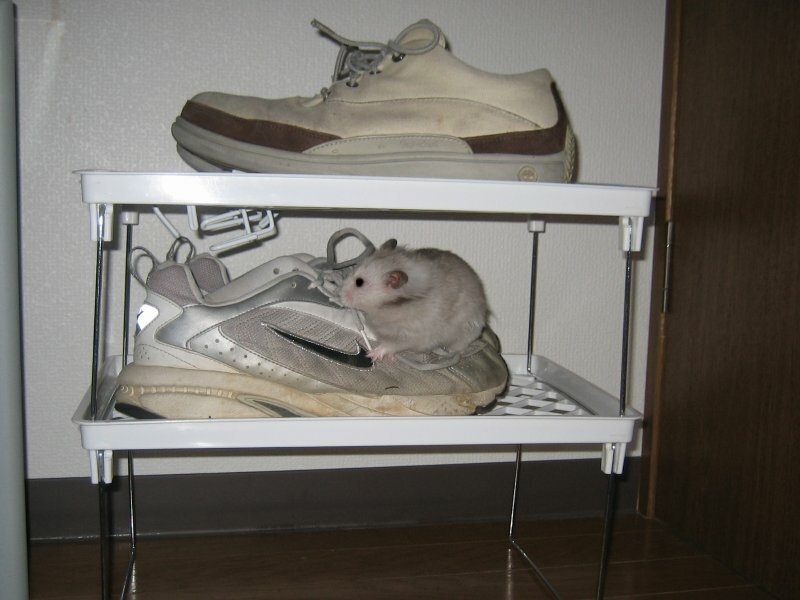 I climbed a white plastic thing and I found a pair of sports shoes in it. But these shoes looked exactly like me! I sniffed around to see if I found a familiar smell, but I couldn't find any. Perhaps they're some distant relatives. I will try to talk to them the next time I go to the kitchen. I got a new house! When Nana left Papa gave me her wooden house. 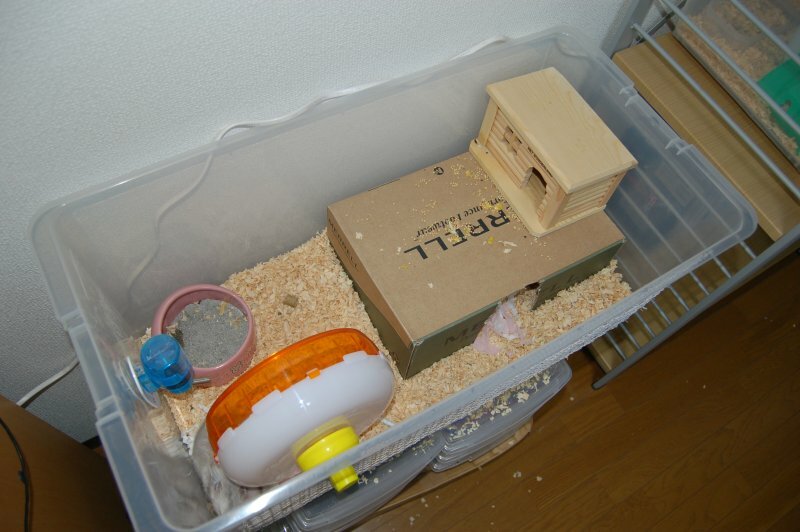 That house is fine when the weather is good because I can build a small nest inside. But now it is a bit cold and the small nest wasn't warm enough. I had to build a big nest outside of the house using lots of tissue paper. I chose the corner under my wheel. I think that my wheel got angry about that, because she didn't want to move anymore after I built my new nest under her. Maybe she's a bit grumpy. Anyway, that problem is solved, because Papa gave me a new house. 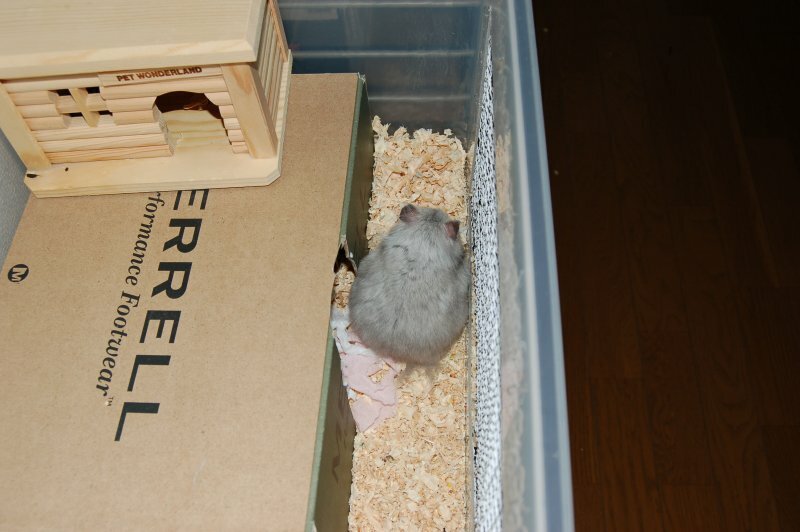 It is a big cardboard hamster house. Papa says that it can be used also as a shoe box. As if someone would want to waste such a nice house by putting shoes in it! This is my new house! 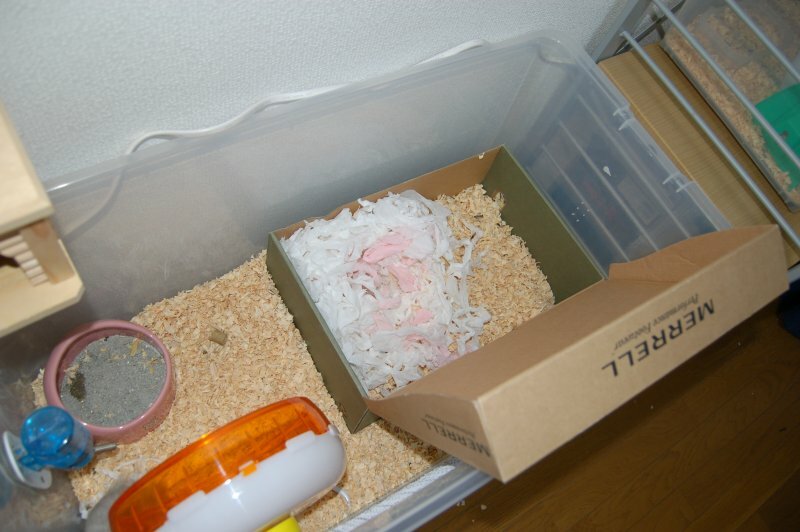 When Papa brought the new house he put some wood shavings inside it and lots of tissue paper. I inspected it and it looked good. It needed more shavings, so I moved some of my bedding inside of the cardboard house. Then I built a very big nest in it. And this is my new nest. It is very comfy. Now I'm very happy with this new house. It's warm and dark inside. I keep some of my food in it too. Aren't you jealous? I will be grooming my fur by the door if you need me. Yesterday Papa brought home a new kind of food pellets. They're like the normal pellets that come with my favourite food mix, but MUCH bigger. I could only fit four in my cheek pouches. I had lots of trouble trying to put the fifth one inside. I kept trying, and trying and still there wasn't any way I could put it there. But I wouldn't give up easily. 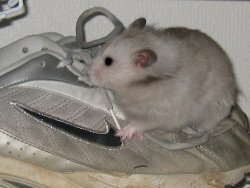 In the end I had to give up and hold it with my teeth while Papa brought me back to my cage. Come on, Papa! Put me back in my cage! I can't hold it anymore! Are you coming or what? I'm getting tired of hanging here. Ok, that's better. Now leave me on the bed and you can go back to the computer.